New Egypt Speedway information center. In action this Saturday will be the Vahlco Wheels Modifieds, Larry’s Hot Rods & Harley’s Northeast Wingless Sprint Cars, Crate Modifieds, 4-Cylinders and the Lyons Construction/Metal Fab Rookie Sportsman. In Vahlco Wheels Modified action, Ryan Godown and Billy Pauch Jr. have won the first two events, will there be a repeat winner or a new face standing in Modified Victory Lane this Saturday? Speaking of Godown, his son Ryan Jr. looks to win his third straight Lyons Construction/Metal Fab Rookie Sportsman feature event this Saturday night. Jermain Godshall looks to go back to back in Larry’s Hot Rods & Harley’s Northeast Wingless Sprint Car action this Saturday night while Opening night winners Ryan Simmons (Crate Modifieds) and TJ Graves (4-Cylinders) look to add on to their winning streaks as well. 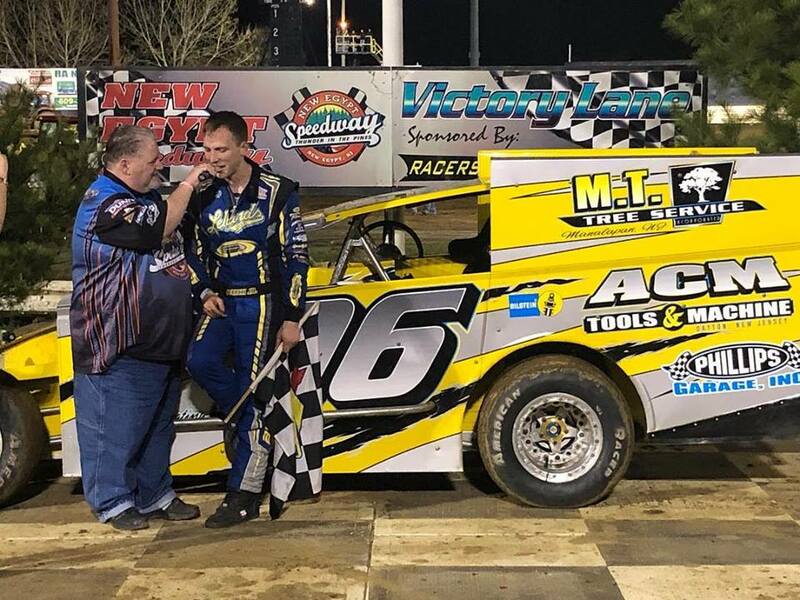 New Egypt, NJ (April 14, 2019) – Billy Pauch Jr. won the Vahlco Wheels Modified feature at New Egypt Speedway. The Delaware Auto Exchange Mid-Atlantic Sprint Series main event was claimed by Bryant Davis. Jim Housworth was the victor in the Hammer Sportsman feature. The Street Stock contest was taken by Bill Liedtka. Ryan Godown Jr. was the victor in the Lyons Construction/Metal Fab Rookie Sportsman race. After the original start of the 30-lap Vahlco Wheels Modified feature was marred by a caution, Cale Ross rocketed to the front on the ensuing green flag with Brian Papiez next in line. As the top two of Ross and Papiez were pulling away from the pack, Mike Butler was continuing his march to the front as the tenth place starter slipped into third place on lap five. Following the second and final yellow flag of the race on the eighth circuit, Ross was still on top with Butler nudging past Papiez for second with sixteenth place starting Billy Pauch Jr. jumping into fourth. One lap later, Papiez regained the runner-up spot. At the midway point of the race, Ross had a half-straightaway advantage over Papiez. Two circuits later, Pauch. Jr. was just in the process of driving by Butler for third when the second place running Papiez pulled into the infield and out of the contest. Now with Pauch Jr. in second and in hot pursuit, Ross was beginning to encounter the tail end of the field with eleven laps remaining. By the twenty-second tour, Ross’s margin over Pauch Jr. had evaporated to a mere two car lengths in heavier lap traffic. Over the next few tours, Ross had Pauch Jr. on his bumper. After a brief side-by-side duel, Pauch Jr. scooted past Ross with only five revolutions left in the race. Over the final laps, Pauch Jr. increased his lead and went unchallenged to grab the checkered flag for his twenty-second career Modified win. Ross held off Butler to take second. With Butler in third, Ryan Krachun finished in fourth after starting the race in eleventh. Brandon Grosso, who started the race in thirteenth, came home in fifth. The winners in the Vahlco Wheels Modified heat races were PJ Oliver and Brian Papiez. 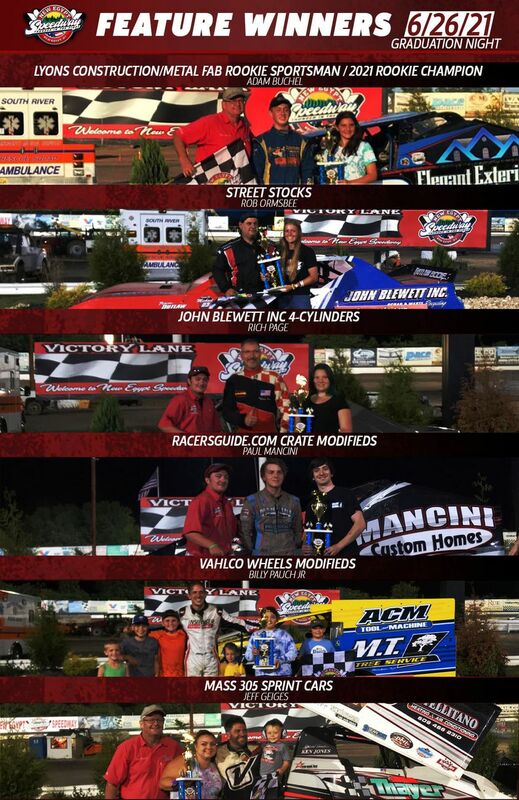 Leading the way in the Vahlco Wheels Modifieds will be the likes of Billy Pauch Jr., Danny Bouc, John McClelland, Brandon Grosso, Davey Sammons, Ryan Krachun & more. 2018 Modified champion David VanHorn is expected to return to action this weekend after fighting off an eye injury during the week last week forcing him out of competition on opening night. This Saturday night will also be the first appearance of 2019 of the Mid Atlantic 305 Sprint Car Series here at New Egypt Speedway as it is also their season opening event of their 2019 campaign. The Hammer Sportsman makes their 2019 season debut this weekend as well at New Egypt Speedway. Title contenders include 2018 track kingpin Bob Lineman Jr., David Burns, Will Dupree, Marty Resnick, Art Liedl, Jimmy Amato & Joseph Brown. Newcomers and drivers returning to the Hammer Sportsman ranks for 2019 include Steve Davis, Jim Housworth, Brad Roberts, John Criscione, and Matt Ellery. New Egypt, NJ (April 7, 2019) – At New Egypt Speedway’s Cabin Fever 40 presented by Oliver Communications Group, Ryan Godown topped the field in the Vahlco Modified feature. The Crate Modified feature went to Ryan Simmons. Jermain Godshall was the victor in the Larry's Hot Rods & Harley's Northeast Wingless Sprint Car main event. TJ Graves took the checkered flag in the 4-Cylinder race with Ryan Godown Jr. winning the Lyons Construction/Metal Fab Rookie Sportsman contest. Polesitter Danny Bouc bolted to the front of the pack as the 40-lap Vahlco Modified feature got underway. On the second circuit, Billy Pauch Jr. moved past Brian Papiez to take over the runner-up spot. The top three of Bouc, Pauch Jr. and Papiez remained intact until the first yellow flag waved on lap four. When action resumed, Pauch Jr. swept past Bouc to grab the lead. Following a trio of caution periods, Pauch Jr. was still in front with thirteenth place starting Ryan Godown in second, Bouc in third, and John McClelland in fourth with seven revolutions completed. During this stretch of green flag racing, Pauch Jr. built up a five car length advantage over Godown with fifteen laps registered. Over the next few laps and with the top two in traffic, Godown quickly closed in on Pauch Jr. By lap twenty-five, Pauch Jr. and Godown were in a side-by-side tussle for the top spot. On the next circuit, Godown wrestled first place away from Pauch Jr. Now heading his rivals and with ten laps remaining, Godown was knifing his way past slower competitors as Pauch Jr. was fighting back to regain the lead. On lap thirty-three, Godown and Pauch Jr. were door-to-door again with Godown using the outer groove. Two tours later, Godown managed to retain his lead following a tangle with a slower running competitor in traffic. As the two-to-go sign was given, Godown still had Pauch Jr. in his tracks. On the final turn of the last lap, Godown fended off another determined challenge by Pauch Jr. to narrowly win his forty-seventh Modified feature. With Pauch Jr. taking second, Bouc’s strong run resulted in third place. McClelland was fourth. Eleventh place starter Brandon Grosso rounded out the top five. Pauch Jr., Bouc and Mike Butler were victorious in the Vahlco Modified heat races. New Egypt, NJ – 71 cars officially went through inspection at New Egypt Speedway on Saturday for their annual free to the public open practice session. The practice that was held from 12-4 saw teams shaking down their machines in anticipation of this Saturday night’s Opening Night. Fast-Timers in each weekly Saturday night division and earning Opening Night redraw positions were John McClelland in the Vahlco Wheels Modifieds with a time of 17.011, Rich Mellor in the Larry’s Hot Rods & Harley’s Northeast Wingless Sprint Cars (18.442), newcomer Matt Ellery in the Hammer Sportsman (18.497), second year Crate Modified campaigner Robbie Holzwarth (18.376) and Jimmy Avery in the 4-Cylinders (23.638). The Chase Begins this Saturday night when Oliver Communications Group presents the Cabin Fever 40 for the Vahlco Wheels Modifieds which will be a 40-Lap main event paying $3,000 to win and $300 to start with regular points plus 25 show up points to all Modified competitors. Also in action will be the Larry’s Hot Rods & Harley’s Northeast Wingless Sprint Cars, Crate Modifieds, 4-Cylinders and the Lyons Construction/Metal Fab Rookie Sportsman divisions. Pit gates will open at 1PM for tech inspection, Grandstands at 4PM with Hot Laps being at 5PM and the first official green-flag of 2019 flying at 6PM. Adult admission (16+) is $22, Seniors (65+) are $20 with Teens (12-15) & Military w/ID being $12 and Kids 11 & Under being FREE! Pit admission will be $30 with a New Egypt Speedway license and $40 without. “New Jersey’s Premier Dirt Track Facility”, New Egypt Speedway is located on Route 539 in New Egypt, NJ just minutes from Six Flags Great Adventure and the New Jersey Turnpike. 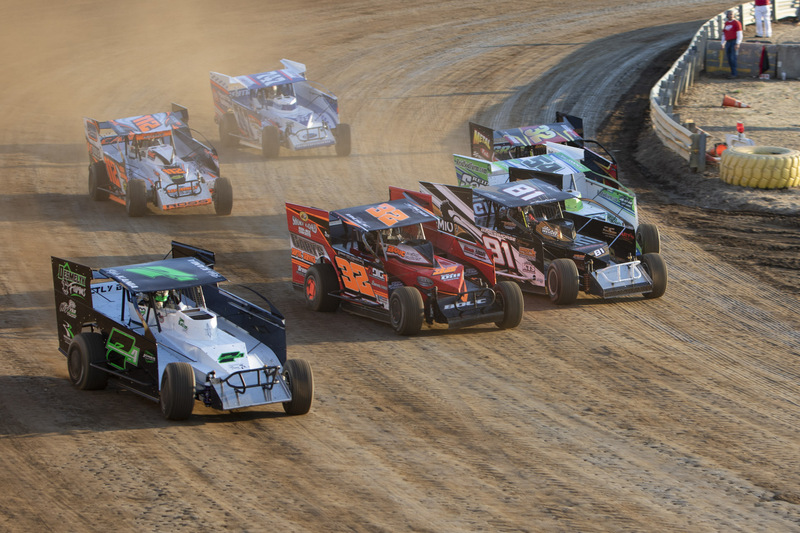 A racy 7/16-mile D-shaped dirt oval, New Egypt Speedway serves Garden State race fans with some of the best competition in the country. New Egypt’s state-of-the-art facilities feature daylight-quality lighting and excellent sightlines from any seat in the house. The grandstands are fully wheelchair accessible with wide, clear, and well-groomed walkways. Concession facilities serve up everything from Jersey Burgers to ice cream treats at family-friendly prices. For more information on New Egypt Speedway, visit online: www.newegyptspeedway.net, “Like” us on Facebook at www.facebook.com/newegyptspeedwayofficial, or follow us on Twitter @nesspeedway.